'It's commendable how earnest Anya Singh remains even after Qaidi Band does everything to undermine her efforts,' says Sukanya Verma. The undertrials of Habib Faisal's Qaidi Band are clearly not in touch with reality. Beaming with an idealism that sticks out uncomfortably in an atmosphere of confinement, they romanticise about freedom and prospects in the vein of a dreamy-eyed Shah Rukh Khan crooning Bas Itna Sa Khwab Hai atop a moving truck. Qaidi Band's biggest undoing is its superficial treatment of a thought-provoking premise. If the idea is to highlight the frustration and plight of India's growing percentage of undertrials or criticise slow-moving judiciary reforms, throwing in a mere mention of Assam native Machung Lalung who spent 54 years behind bars without trial like trivia does precious little to make its point. Credited for its story, screenplay, lyrics, dialogues and direction, Faisal assumes a lot of roles to tell a story based on real events -- one of them is when Tihar Jail's in-house band Flying Souls played alongside Delhi-based rock group Menwhopause, the rest is mostly bogus. 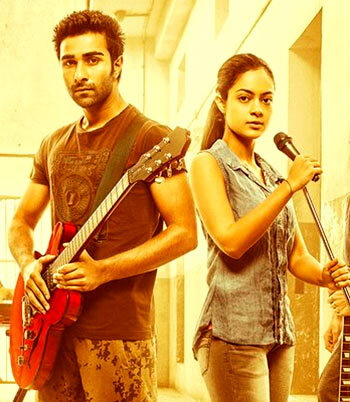 On the behest of a devious jailer (a sly, smoothly sinister Sachin Pilgaonkar), Sanju (Aadar Jain) and his guy gang -- a Nigerian, a Sardar and a BTech/MBA team up with Bindu (Anya Singh) and the girls -- one's from Nagaland, another a Russian to prepare a musical orchestra as part of the Independence Day celebrations. Eager to be in his good books, they put on a successful show, one that catches the media's attention as well as mileage-hungry politicians. During the course of these events, Sanju and Bindu become close and reveal their individual reasons for landing in jail. Funny how Sanju's boys remain crucial to the narrative till the end whereas Bindu's gal pals are conveniently discarded right after Faisal has done his bit for tokenism. Even as you are wondering about their unusually chirpy disposition and hip fashion sense languishing in crammed chambers and dimly lit dingy corners, a rock band called Middle Finger, one that looks like it's never performed a day in their lives, drops by to jam together. The mandatory social media circus is quick to follow. Amit Trivedi's I Am India may claim anthemic popularity on screen, but off it there's nothing to write home about. Going by the name of Sainanis now, they liken themselves to modern-day freedom fighters. If you think that's wishful thinking at its most absurd, wait and watch Qaidi Band's awkward third act bursting with fake fans, foolish revolution and flimsy notions of a fairy tale. Faisal never expounds on the psychology of these detainees let alone source of their strength or revolt. It's impossible to sympathise or take his whitewashed version of the truth seriously. In the face of such overwhelming looniness, it's commendable how earnest Anya Singh remains even after Qaidi Band does everything to undermine her efforts. The newcomer is all pluck and marvellously uninhibited in front of the camera. Aadar Jain is completely outshined by her intensity. He doesn't register beyond a harmless second fiddle. But even he deserves better than a wearisome launchpad like this.